Pink poinsettias are my favorite color of that flower. I love the boldness of the red, but the pink really is prettiest to me. 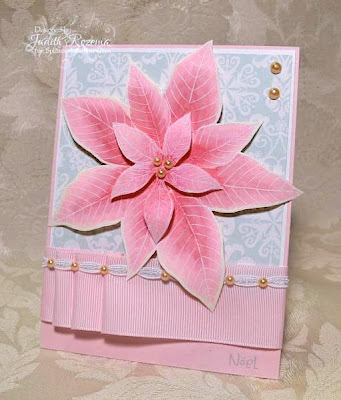 So for my first December post, I decided to share this pink poinsettia! The image is from Hero Arts. I stamped it three times and embossed with White embossing powder, coloring with Copics, and then cut it out and layered it, adding Latte Pearls to the center. The gorgeous Pearl Pink Grosgrain ribbon provided a beautiful "border".I added a little vintage trim from one of my "junk jaunts" and more Latte pearls. A little subtle sentiment from Inky Antics and all done! Everything is held together with Scor-Tape. What is your favorite poinsettia color? So beautiful .love the colors. Beautiful card Judy!! I love that poinsettia. I love the pink ones too!!! This is a really elegant and pretty card! Love the pearls in the center, perfect finishing touch! Really lovely! Love the way you layered the lace & perals with the pink ribbon!